If you have never had a mini Dachshund before, there are a few things you should know about their traits and characteristics. The word Dachshund is German for ‘badger dog’. They are a hound dog bred to hunt badgers and other small animals underground. So, a very instinctive trait, you will notice that your mini Dachshund loves to ‘dig’ or burrow into his bed or blanket. A fun game to play with your Dachshund is to move your hand around under a blanket and watch him ‘dig’ on the top of the blanket for minutes at a time sometimes – while trying to get it. Once the Dachshund would locate the small animal, he was trained to alert his master by barking. So, again, by their characteristic trait, Dachshunds have a reputation for excessive barking. But know that your mini Dachshund can be trained to avoid excessive barking. Even as I write this, Sampson is staring out the front window, watching a cat in the yard about 15 feet away and he’s not barking. Oh, sure, he let out one little warning bark. But I told him, ‘No!’ and reassured him with a pet on the head that it was okay that the cat is in the front yard. Now, he is sitting quietly just observing. Your Dachshund wants to learn and please you, so repetition and patience on your part is the key. Bred to burrow underground, a Dachshund trait is the ability to see with less light, however typically their long distance vision can be poorer (I know we have noticed this trait a little bit with Sampson – sometimes not recognizing you from a distance). Yet there have also been times when he has spotted things in the back yard at night before I have seen them. A very special trait is how Dachshunds are very lovable and faithful companions that, I think, don’t really understand they are dogs. They see themselves as part of your human family and because of this they want to be with you as much as they can. They are not the type of dog that can be left alone all day in the back yard. They want to be an integral part of your life, so be prepared for a 12 to 15 year commitment. They will become, essentially, another family member. They will follow you around, sit with you, interact with you and ‘talk’ to you. Dachshunds love to communicate verbally. You will have to learn to understand this ‘second’ language. Don’t worry, your Dachshund will teach you! This is just a general overview of the common traits of the Dachshund breed. They will love you unconditionally and provide you with years of companionship and entertainment. My two are attached at my hip at almost every minute of the day. 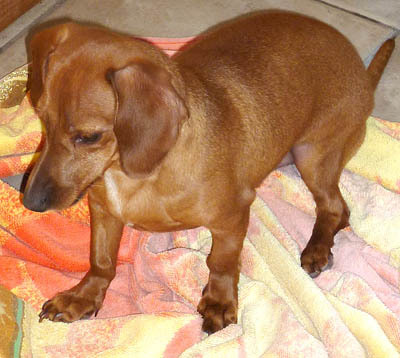 Hi I have a granddaughter called Maya who is a red Doxie and is almost 2. She is the love and light of my life. She was so small when we got her (8 weeks) that she fitted in my husband’s hand. She does not like to lick and if you do get a lick, consider it an honour. But she barks, plays, runs like made, gets into everything (even steals the washing – socks especially), loves to snuggle (under the covers and close to your skin, of course) and is basically the princess of the house. And we play this game where my hand is the badger and she kills the badger often ….. i have the kill marks to prove it, although she does not bite hard. And the funniest is when she does kill the badger and you keep your hand still, she tries all she can to revive the hand so she can kill it all over again. She is a joy and a blessing. We love her dearly.